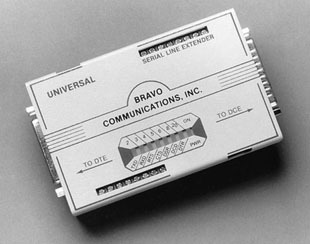 Bravo's High-Speed Parallel Line Extender (Model 1042E) is a long-time favorite and is the only true parallel extender on the market that regenerates all the DB25 connector parallel signals to extend up to 3,000-foot distances (normally parallel signals are limited to around 10-feet reliably) and is compatible with all Centronics, IBM® and Bi-Directional (nibble mode) parallel equipment. This product has been used in applications for aircraft, race pit analysis for race cars, diagnostics and control equipment signal quality applications and for office peripherals distance extension just to name a few applications. 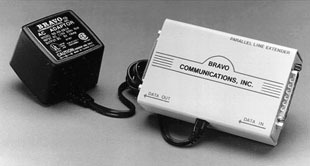 Bravo's Serial Line Extenders (2042E and 2042EX) are unique universal and multifunctional line extender products that will provide distance capability for virtually all serial equipment in any serial application. Breaking the 50-foot serial interface distance barrier, Bravo's 2042E extender supports all serial data speeds up to 40 Kbps while the 2042EX supports all serial data speeds up to 120 Kbps plus has 15KV surge protection built-in. Each allows you to achieve distances up to 1 mile over all types of serial cable media. Multiple units may be used for increased distances. The Bravo Serial Line Extenders are single, straight-thru, transceiver units that regenerate all the important signals of the RS-232/V.24 interface, and thereby filters, amplifies, and reshapes these signals for reliable long distance applications. Because the extenders are designed with high-quality drivers and receivers and finely honed circuitry, they have the ability to receive signals over long distances as well as to drive these signals over long distances. This feature provides flexibility in placement of the units anywhere along the cable run path. Note: Add to model number suffixes “-EC” for European Continental power supply and “-UK” for UK style power supply. Copyright © 2019 BRAVO COMMUNICATIONS, INC. All rights reserved.